Hollowcore floor slabs are pre-stressed concrete elements that have a constant cross section. They are manufactured using high tensile strength pre-stressed strands or single wires embedded within the element. The production of these elements is achieved using our Extruder and Slipformer machines that cast in one phase along a production bed without the need of any form works. Hollowcore slabs are highly developed structural elements and used all over the world due to their many advantages and diverse applications. Today they are one of the most well known prefabricated elements because of their technical and economic characteristics. Builders widely use hollow core slabs for flooring and wall panels in industrial, commercial, residential and infrastructure construction. For infrastructure hollow core slabs are used extensively to protect roads from natural dangers. They are used to construct anti-landslide and avalanche guards as well as the road decking itself, all elements requiring high loading specifications. Hollowcore slabs possess certifiable fire resistances and offer and economic solution to construct fire stop walls for warehouses, industrial buildings and car parks. Pre-fabricated slabs are placed directly on the walls or steel structures. The minimum depth of Bearing on the wall is 90 mm and 75mm steel. A concrete mix is used to fill the spaces between slabs, with the addition of increasing its strength. A pre-chamber of approximate length/300 (+/-50%) can be expected on all prestressed slabs, and the camber may vary between adjoining slabs. Allowance for this should be in conjunction with finishes and finished floor levels. Pre-stressed Hollowcore units are the most useful elements of floor construction in multi-storey buildings and residential apartments. Hollowcore slabs provide considerable benefits to builders and house owners. They are the ideal choice for constructing floors in individual homes, both at ground level and upper level. Hollowcore floors are used due to their lower cost and quick erection installation time. Hollowcore concrete slab is a versatile precast element. Hardly any building materials available today offer the economy, flexibility and reliability of precast, prestressed concrete. Suitable for insulation & underfloor heating system. Cantilever slabs have design advantages e.g. balconies. Superior acoustic insulation and thermal properties. An improvement in span and loading ratio by structural screed application. Continuous voids in Hollowcore slabs can accommodate electrical or mechanical services. Excellent lower surface finishes ready to paint. Easy project implementation is giving designers greater versatility. Easily adapted to enable mounting on ancillary building system. High durability and load resistance. Can have long spans without the need of temporary supports. The green product reduces the use of raw material. Through the choice of the different thicknesses of the lower part of the element, floors can be produced with a high fire resistance up to 180 minutes. Hollow core slabs have minimal deformation even with high slenderness ratios due to the transversal load distribution and even when the elements do not have any concrete topping. The produced elements have high load resistances thanks to a low water/cement ratio of concrete from 0.25 to 0.35. Higher water/cement ratios cannot be employed for the production of desired cross sections without the use of expensive formworks. Large production volumes with uniform cross sections even with different cable reinforcement configurations. Once the concrete elements have been produced, they can be removed from the casting beds after just 6-8 hours. Lower self- weight: The presence of longitudinal voids in the cross-section leads to approx. 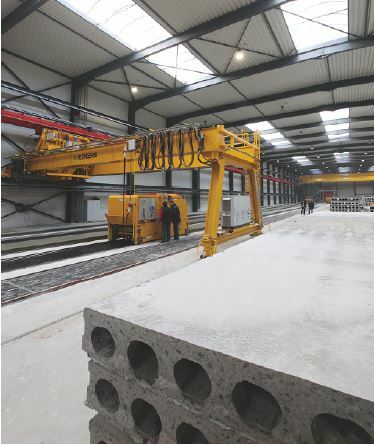 50% saving in concrete compared with a plain cast in-situ reinforced slab, and at the same time cuts the amount of prestressing steel by 30% because of the lower self-weight. Assured quality: By using specific equipment for the manufacture of the concrete elements and a high-end quality control system.The lower surface of the element is smooth having a steel formwork finish. This surface can be left as seen or can be simply painted. Easy project implementation is giving designers greater versatility: Hollow core slabs have a wide range of applications. They can be produced up to 25 m long. They are very common in the residential, healthcare, education, industrial and commercial markets and also in seismic zones. It is possible to manufacture elements with end openings that are then filled on-site in an orthogonal direction to the floor creating solid ends to increase shear resistance. Easily adapted to enable mounting on ancillary building system: Hollow core slabs are ideal for the mounting of the ancillary plant such as electrical trays, water sprinkler and HVAC systems. High durability and load resistance: Prestressing technology ensure the long lasting and exceptional loading. Multiple metal wires (strands) prestressed and cast in our slabs giving them extreme strength and very long design life. Long spans without temporary supports: Applicable to all loads and spans meaning that there is no need for supports during installation. It is possible to load the floor immediately after installation, even without any in-situ concrete casting. Green product reduced use of raw material: Hollow core slabs are economical with their use of materials. One reason is that the premaster normally uses fairly high concrete and steel grades. Consequently the products use fewer materials to achieve the same load bearing capacity as cast in-situ structures. The presence of longitudinal voids in the cross-section leads to about 45% saving in concrete compared with a plain in-situ cast reinforced slab and at the same time cuts the amount of prestressing steel by 30% because of its lower intrinsic weight. Prefabricated prestressed hollow core slabs. Upper surface smooth or rough. Soffit smooth surface does not require. Prestressing Strand up to 14 number wires, from 9.3; 12.5 and 15.7mm. The nominal tensile strength of 1860 MPa. Precast concrete staircases provide unobstructed, early, secure and instant work platform during construction. This solid footprint helps speed up construction provides a safer working environment by allowing immediate access to be gained. With a quick installation time frame, the installation of precast concrete staircases will save both times and cost with the elimination of site shuttering and scaffolding, resulting in reduced construction site cost and often saving weeks on the project schedule. As Precast concrete needs no additional curing on site and does not require protection from weather conditions, the installation process is quick, neat, clean and dry. With the intrinsic properties of thermal inertia, precast concrete staircases allow a more constant temperature both in cold and hot regions, as well as acoustic insulation. The densities of the material ensure effective sound reduction and a min 1h fire resistance making this an ideal choice for commercial and residential use. Our set of software packages ensure the safest top quality product and eliminate any chance of human error. Our quotation is based on client drawings. Along with price, we will provide personalised design including steel beams & lintels layout. When we get approval from your engineer your project will go to the production stage, and you will be informed about delivery and fitting date which will be no longer than two weeks from approval date.